Louis-Claude Daquin was born in Paris to a reasonably well-connected family. On his mother’s side he was related to Rabelais, on his father’s to the Rabbi of Avignon (who had converted to Christianity before he died in 1650). His great uncle was one of Louis XIV’s doctors and a King’s Counsellor. His father was a painter who travelled widely but with little commercial success. Louis-Claude was one of five children, but the only one to reach adulthood. Little in his background would seem to have pointed to a musical career but Daquin showed a precocious talent at the keyboard as a very young boy; he was given some early lessons by a chaplain at the Sainte-Chapelle and informal instruction in composition by Nicolas Bernier. At the age of six he is said to have been heard by the King himself: the Dauphin predicted that he would become ‘the leading man of his age’. At the age of eight he reportedly directed (under Bernier’s guidance) a performance of his own Beatus vir for a large chorus and orchestra at the Sainte-Chapelle. His keyboard skill rapidly won him a variety of posts: in 1706 he became organist with the Hospitaliers de St Antoine and assistant to Marin de la Guerre at the Sainte-Chapelle. His first adult success came in 1727 when he defeated Rameau in a flamboyant competition to become organist at St Paul. Louis Marchand heard him play there and they became friends. As Marchand was dying in 1732 he is supposed to have said to his organ at les Cordeliers: ‘Farewell, dear widow: only Daquin is worthy of you.’ Daquin duly succeeded him. His crowning professional achievement came in 1739 when he was appointed as one of the King’s personal organists. In first performance of this role he ‘surpassed himself and astonished the whole Court’, according to the Abbé de Fontenay, leading the King to extend his personal compliments and to spend no less than a quarter of an hour discussing the prodigy with the Comte d’Eu (who was to become a patron to Daquin). He became organist at Notre-Dame in 1755. Our knowledge of Daquin’s life and character depends heavily on his son, who collected and published letters about leading figures of the day. If his biographers are to be believed, Daquin was a man of simple tastes, unimpeachable probity, great piety and independence of mind, who was above ambition or commercial interest, achieved glory without seeking it, and loved art for its own sake. He was even on friendly terms with his greatest rival, Calvière. How literally we take such hagiography is a matter of judgement, but there can be no doubt about his skill at the keyboard. He was recognized as the finest improviser of his day—even winning the approval of Rameau. His hallmarks were the precision of his playing and his ability to treat both hands equally. He carried on playing until the very end of his life: according to Sébastien Merlier in his Tableau de Paris Daquin wowed a large crowd just three weeks before his death with an improvisation on Iudex crederis, at which his playing ‘instilled such vivid impressions in their hearts that everyone went pale’. Daquin is reported to have composed a variety of choral and orchestral works as well as keyboard music but only two works survive. The first (from 1735) is a book of harpsichord suites dedicated to his pupil Mlle de Soubise, which includes, among a range of virtuoso showpieces, imitations of a cuckoo and a storm. The second (from about 1740) is the collection of twelve Noëls on which his fame principally rests. They were dedicated to the Comte d’Eu (Louis-Auguste de Bourbon, Prince de Dombes, son of the Duke of Maine, and a prominent figure at the Court). He was an important patron for Daquin, whose generosity, according to his biographers, was to prevent the composer from dying a poor man. Both the harpsichord suites and the Noëls reveal Daquin as a composer contrasting to his immediate predecessors, Lalande, Charpentier, Couperin and Rameau. Less concerned with structure or form, with modulation or genuine counterpoint, he aimed more towards pictorial immediacy and virtuosity for its own sake. His ability to break a melody into its component fragments and develop them in dazzling passagework, without losing sight of the original melody, was unsurpassed. The form of the Noël suited his particular skills perfectly. Collections of Christmas verses, some with music, began to appear in France in the fifteenth century and spread widely in the sixteenth. Noëls—vernacular Christmas verses—had featured at Christmas Mass since medieval times. In the course of the seventeenth century, organists came to use them as the basis of extended improvisations, filling whatever time was available before midnight. Instrumental and vocal arrangements of carols were also used. The first surviving collection of variations for organ is by Nicolas-Antoine Lebègue (1676), in effect the founder of the genre; others by Nicolas Gigault (1682), André Raison (1714) and Pierre Dandrieu (1720) followed. After Daquin there were further sets by Michel Corrette (1753) and Claude Balbastre (1783). In his indispensable book La Musique d’orgue français de Jehan Titelouze à Jehan Alain (Paris, 1949), Norbert Dufourcq notes that: ‘The Noël with variations required a special manual skill. Not just any comer could acquire it. The point was not to prove originality. The whole point was spirit—and fingerwork. Plenty of Frenchmen of the time lacked for neither. That is why they were past masters in this facile art, far removed from the true French organ style and which borders on descriptive music … sketches in fresh colours, pictures with clear outlines, the Noëls of a Pierre Dandrieu, of a Michel Corrette, or a Dornel, of a Daquin, have no counterpart that we know of in the entire corpus of organ music.’ As Jean-Jacques Rousseau explained in his Dictionary of 1768, Noëls ‘should have a rustic and pastoral character matching the simplicity of the words and of the shepherds who were supposed to have sung them while paying homage to Christ in the crib’. Daquin, Dufourcq concludes, was ‘le roi des Noëlistes’. 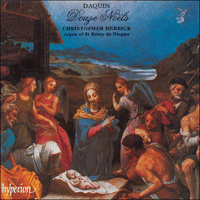 Daquin’s Noëls are described on the title page as being for ‘organ and harpsichord, most of which could be performed on violins, flutes, oboes, etc’. There is no doubt that they are written with the sonority of the French Classical organ in mind, but many could be played on one or two harpsichords, and the simpler ones on other combinations of instruments. Almost all the melodies are known from other sources, but often with a variety of texts. Christopher Hogwood, in his 1983 edition, has tentatively given a title to all but one, but notes that our knowledge is too thin to be able to read any but the broadest programmatic meaning into the settings. The mood varies from the boldness and brilliance of No I to the tenderness of No VII (with its lilting melody over a chromatic bass) and the final overwhelming weight of No XII, with its use of the great pédale de trompette. Many of the Noëls employ a cumulative variation technique in which the figuration becomes increasingly rapid as the piece progresses, producing an effect of ever greater brilliance. Stunning echo effects are achieved, as in Nos I, VI and X, by hopping from manual to manual (grand orgue, récit, écho). The pedal-writing in Nos II and IX implies a wide compass similar to the viola da gamba; this is accommodated by using the 4-foot flûte on its own. The first record of an organ in France dates from the eighth century. By the tenth century Rheims was a centre of excellence for French organists. Illustrations on manuscripts suggest that the organ played a central part in French church music in the following centuries. Guillaume de Machaut is generally credited as having been the first (in the fourteenth century) to refer to the organ as ‘the king of instruments’. Organs came to be very large and elaborate: the organs at Amiens (1429), Rheims (1487) and Strasbourg (1489) all had more than two thousand pipes. By the seventeenth century the great tonal variety had come to be codified, giving way to a remarkable consistency of design and registration that lasted until the Revolution. This consistency was unmatched in Germany and Northern Europe. Side by side with an established pattern of organ design went a well-defined school of playing, represented by a few key individuals: Eustache de Caurroy (whose fantasias of around 1610 provided the foundation of the French School) at the Sainte-Chapelle; Jean Titelouze (1563–1633) at Rouen; André Raison (1646–1721) at Nanterre; and Nicolas de Grigny (1671–1703) at Rheims, whose Livre d’Orgue, which Bach knew and copied, can be seen as the summation of the school. Central to the distinctive character of the French Classical tradition is the plein jeu, the rich and full texture which came from what Fenner Douglass has called ‘the controlled brilliance of mixtures which were neither strident nor piercing’. It is supplemented by other tonal groups arranged in an orderly way; and in particular by distinctive reed sounds, the jeux d’anches, including the full-length trompette, the cromorne and the voix humaine. Favourite textures were the jeu de tierce and the cornet (built around flute stops sounding the third and fifth in the scale). The organ in the Church of St Rémy, Dieppe, is one of the best surviving examples of the French Classical model and is the finest eighteenth-century organ in Haute Normandie. It was built by the Rouen-based organ-builder Claude Parizot between 1736 and 1739, making it almost exactly contemporary with Daquin’s Noëls. Parizot was one of three organ-building brothers based in Normandy. He was also responsible for the organ in Notre Dame de Guibray in Falaise. He was assisted in Dieppe by Georges Daniel Faul. The carpentry was organized by the master-craftsman Nicolas Le Queu, and sculptures by A Armand of Paris. The casing has been described by Dufourcq as having a ‘happy composition, sober elegance and some picturesque detail’, notably its fine statues of angels playing a transverse flute and a bass viol. Félix Raugel (in 1932) described the organ as having a ‘rounded, mellow and pure sound’. He noted that the pleins jeux, which were so often mediocre, were given superior treatment here; and that the voicing, while well-supported and full, was not strident. It has survived the inevitable updatings and ‘restorations’ remarkably well. After only minor revisions in the eighteenth century, restoration by Ducroquet in 1846 left the mechanism and specification largely untouched, but installed new bellows to increase and improve air-flow. The tuning was raised to modern pitch in 1880. Rather more substantial alterations were made in 1886, when Brière, reflecting the general distrust of ancient manufacture, removed the two demi-claviers, the récit and the écho, replacing them with a modern récit expressif. Other changes were made to suit the Romantic taste of the period, and in 1915 still further ‘improvements’ were made by an amateur. In 1930 the organ restorer Victor Gonzalez was commissioned to report on the organ. He found much of it in the same state as it had been for two centuries. He proposed three tranches of improvements, designed (as they then saw it) to keep the original specifications and sonorities so far as possible. Only the first tranche was carried out (in 1936–1938). Writing for the organ’s bicentenary in 1939, Dufourcq found it largely intact, and Parizot’s voicings scarcely changed despite the successive alterations. One of the principal reasons is the high tin content (some 75%) of the alloy used for the pipework. In 1992 the Caën organ-builder Jean-François Dupont undertook a complete historic reconstruction of the organ. Since about 70% of the original pipework from 1739 survives, and with the organ at Falaise as an additional reference point, it has been possible to return this important instrument to its former glory, adding only the pedal soubasse to Parizot’s original scheme. The organ sound is greatly enhanced by the fine acoustic of the church. Louis-Claude Daquin est né d’assez bonne famille à Paris. Il était parent de Rabelais du côté de sa mère, et du rabbin d’Avignon (qui s’était converti au christianisme avant sa mort en 1650) du côté de son père. Son grand-oncle était l’un des médecins de Louis XIV ainsi que conseiller du roi. Son père était un peintre qui voyageait beaucoup, mais qui avait peu de succès commercial. Louis-Claude faisait partie d’une famille de cinq enfants, mais il fut le seul à atteindre l’âge adulte. Peu de circonstances relatives à son passé sembleraient l’avoir destiné à une carrière musicale, mais déjà très jeune garçon, Daquin fit preuve d’un talent précoce au clavier; un aumônier à la Sainte-Chapelle lui donna ses premières leçons, et Nicolas Bernier lui enseigna la composition de façon non-académique. On raconte qu’à l’âge de six ans, il fut entendu par le roi lui-même: le Dauphin prédit: «Il deviendra le premier homme de son siècle.» On raconte également qu’à l’âge de huit ans, il dirigea (guidé par Bernier) une interprétation de sa propre composition, Beatus vir, pour chœur de taille importante et orchestre, à la Sainte-Chapelle. Son talent au clavier lui valut une variété de postes: en 1706, il devint organiste avec les Hospitaliers de St Antoine et assistant de Marin de la Guerre à la Sainte-Chapelle. Son premier succès d’adulte eut lieu en 1727, lorsqu’il vainquit Rameau lors du concours plein de brio pour le poste d’organiste de St Paul. Ce fut là que Louis Marchand l’entendit jouer et les deux hommes devinrent amis. On raconte qu’en 1732, Marchand, proche de la mort, se serait séparé de son orgue aux Cordeliers en ces termes: «Adieu, ma chère veuve, d’Aquin deul est digne de toi.» Daquin lui succéda dûment. Il atteint le sommet de la réussite professionnelle en 1739 lorsqu’il fut nommé l’un des organistes personnels du roi. À ses débuts dans ce rôle, il «se surpassa lui-même et étonna toute la Cour», selon l’abbé de Fontenay, conduisant le roi à redoubler de compliments personnels et à passer plus d’un quart d’heure à discuter du prodige avec le Comte d’Eu (qui deviendrait plus tard le protecteur de Daquin). Il devint organiste à Notre-Dame en 1755. Tout ce que nous connaissons de la vie et de la personnalité de Daquin repose surtout sur son fils, qui recueillit et publia des lettres concernant les personnalités importantes de l’époque. Si l’on en croit ses biographes, Daquin était un homme aux goûts simples, d’une honnêteté irréprochable, d’une grande piété et d’une certaine indépendance d’esprit, qui se trouvait bien au-dessus de toute ambition ou de tout intérêt commercial, atteignit la gloire sans la chercher, et aimait l’art pour l’art. Il était même en bons termes avec son plus grand rival, Calvière. Chacun, selon son jugement, prendra ou non cette hagiographie à la lettre, mais on ne peut nullement douter de son talent au clavier. Il fut reconnu comme l’improvisateur le plus raffiné de son époque—et gagna même l’approbation de Rameau. Les signes caractéristiques de son talent résidaient dans la précision de son exécution des morceaux et dans sa capacité à utiliser les deux mains sans distinction. Il continua à jouer de la musique jusqu’à son dernier souffle: selon Sébastien Merlier dans son Tableau de Paris, Daquin provoqua l’enthousiasme d’une foule immense juste trois semaines avant sa mort, avec une improvisation sur Iudex crederis, durant laquelle son exécution «porta dans les cœurs des impressions si vives que tout le monde pâlit». On rapporte que Daquin composa un certain nombre d’œuvres pour chœur et pour orchestre, ainsi que de la musique pour instruments à clavier, mais seules deux œuvres ont survécu. La première (de 1735) est un recueil de suites pour clavecin dédié à son élève Mlle de Soubise, qui comprend, parmi un éventail de morceaux de virtuose remarquables, des imitations de coucou et de tempête. La deuxième (datant d’environ 1740) est la collection de douze Noëls, sur lesquels repose principalement sa célébrité. Ils furent dédiés au Comte d’Eu (Louis-Auguste de Bourbon, Prince de Dombes, fils du Duc de Maine, et personnalité éminente à la cour). Pour Daquin, ce dernier fut un important protecteur dont la générosité, selon ses biographes, empêcha le compositeur de mourir en homme pauvre. Les suites pour clavecin et les Noëls révèlent un Daquin compositeur en contraste avec ses prédécesseurs immédiats, Lalande, Charpentier, Couperin et Rameau. Moins préoccupé par la structure ou par la forme, par la modulation ou par le véritable contrepoint, il visait plus au caractère pictural immédiat et à la virtuosité en tant que telle. Sa capacité à rompre la mélodie en ses fragments composants et à les développer en une éblouissante formule ornementale, sans perdre de vue la mélodie originale, n’a jamais été égalée. La forme du Noël convenait parfaitement à ses talents particuliers. Les collections de chants de Noël, dont certains accompagnés de musique, firent leur apparition en France au XVe siècle et se répandirent largement au XVIe siècle. Les Noëls—chants de Noël du pays—avaient été utilisés pour les messes de minuit depuis le Moyen-Age. Au cours du XVIIe siècle, les organistes se mirent à les utiliser comme bases pour des improvisations prolongées, occupant ainsi le temps qu’il restait avant minuit. Des arrangements instrumentaux et vocaux de chants de Noël étaient également utilisés. La première collection de variations pour orgue à avoir survécu est de Nicolas-Antoine Lebègue (1676), qui fut en fait le fondateur du genre; d’autres de Nicolas Gigault (1682), André Raison (1714) et Pierre Dandrieu (1720) suivirent. Après Daquin, d’autres collections de Michel Corrette (1753) et Claude Balbastre (1783) parurent. Dans son ouvrage indispensable La Musique d’orgue français de Jehan Titelouze à Jehan Alain (Paris, 1949), Norbert Dufourcq constate: «Le Noël avec variations exige un tour de main spécial. Ne l’acquiert pas qui veut. Point n’est pas la peine de faire preuve d’originalité. Le tout est d’avoir l’esprit … et les doigts. Or, bien des Français de cette époque ne manquent ni l’un ni des autres. C’est pourquoi ils sont passés maîtres dans cet art facile, très éloigné du véritable style de l’orgue et qui côtoie le domaine de la musique descriptive … esquisses aux couleurs fraîches, dessins aux contours fermes, les Noëls d’un Pierre Dandrieu, d’un Michel Corrette, d’un Dornel, d’un Daquin n’ont point, que nous sachions, leur pendant dans tout autre musique d’orgue.» Comme l’expliqua Jean-Jacques Rousseau dans son Dictionnaire de 1768, les Noëls «devraient être dotés d’un caractère rustique et pastoral, qui épouse la simplicité des paroles et des bergers qui étaient censés les avoir chantés en rendant hommage au Christ dans la crèche». Daquin, conclut Dufourcq, était «le roi des Noëlistes». Les Noëls de Daquin sont décrits sur la page titre comme étant «pour l’Orgue et pour le Clavecin, dont la plûpart peuvent s’éxécuter sur les Violons, Flutes, Hautbois, &c». Qu’ils aient été écrits avec, présente à l’esprit, la sonorité de l’orgue classique français, ne fait aucun doute, mais un certain nombre de ces Noëls pourraient être joués avec un ou deux clavecins, et les plus simples avec d’autres combinaisons d’instruments. Presque toutes les mélodies sont connues à partir d’autres sources, mais souvent avec une variété de textes. Christopher Hogwood, dans son édition de 1983, a, à titre d’essai, donné un titre à tous ces textes excepté un, mais constate que notre connaissance s’avère trop insuffisante pour pouvoir déchiffrer des éléments autres que les grands traits du programme dans les mises en musique. Le mode varie de la hardiesse et de la netteté du no I à la tendresse du no VII (par sa mélodie cadencée sur une basse chromatique) et à l’irrésistible force finale du no XII, par son utilisation de la grande pédale de trompette. Beaucoup de Noëls comportent une technique de variation cumulative, dans laquelle la figuration devient de plus en plus rapide au fur et à mesure que le morceau avance, produisant un effet de brillance encore plus grand. De formidables effets d’échos sont réalisés dans les nos I, VI et X, en passant d’un clavier manuel à l’autre (grand orgue, récit, écho). La composition pour pédale dans les nos II et IX comporte une grande étendue semblable à la viole de gambe; cela fut rendu possible par l’utilisation de la flûte quatre-pieds seule. L’apparition du premier orgue en France remonte au VIIIe siècle. Dès le Xe siècle, Reims était devenue un centre d’excellence pour les organistes français. Des illustrations sur certains manuscrits suggèrent que l’orgue joua un rôle essentiel dans la musique sacrée française au cours des siècles qui suivirent. On attribue généralement à Guillaume de Machaut (au XIVe siècle) la première référence à l’orgue comme «le roi des instruments». Les orgues devinrent très grandes et plus complexes: les orgues d’Amiens (1429), Reims (1487) et Strasbourg (1489) possédaient toutes plus de deux mille tuyaux. Au XVIIe siècle, cette grande variété tonale fut de ce fait codifiée, amenant ainsi une remarquable cohérence de conception et de registre qui dura jusqu’à la Révolution. Cette cohérence n’avait pas de correspondant en Allemagne ni en Europe du Nord. En parallèle à un modèle établi de conception des orgues se trouvait une école d’interprétation bien définie, représentée par certains individus importants: Eustache de Caurroy (dont les fantaisies datant d’environ 1610 furent à la base de l’École française) à la Sainte-Chapelle; Jean Titelouze (1563–1633) à Rouen; André Raison (1646–1721) à Nanterre; et Nicolas de Grigny (1671–1703) à Reims, dont le Livre d’Orgue, que Bach connaissait et qu’il copia, peut être considéré comme une résumé sur cette école. La tessiture riche et pleine qui provenait de ce que Fenner Douglas appelait «la brillance contrôlée de jeux de mutations jamais stridentes ni perçantes» se trouvait au centre du caractère distinctif de la tradition classique française du plein jeu. Celle-ci est complétée par d’autres groupes tonaux arrangés de façon ordonnée, et en particulier par des sons d’anche distinctifs qu’on appelle les jeux d’anches, sans oublier la trompette longue, le cromorne et la voix humaine. Les tessitures que l’on préférait étaient le jeu de tierce et le cornet (bâties autour des jeux de flûtes qui produisent la tierce et la quinte dans la gamme). L’orgue de l’église de St Rémy, à Dieppe, constitue l’un des meilleurs exemples qui aient survécu du modèle classique français, et représente l’orgue de Haute Normandie le plus beau du XVIIIe siècle. Il fut élaboré par le fabricant d’orgues de Rouen, Claude Parizot, entre 1736 et 1739, ce qui le rendit presque exactement contemporain des Noëls de Daquin. Parizot était l’un des trois frères fabricants d’orgues établis en Normandie. Il fut également à l’origine de l’orgue de Notre Dame de Guibray à Falaise. Pour celui de Dieppe, il reçut l’aide de Georges Daniel Faul. Le travail de menuiserie fut réalisé par le maître-artisan Nicolas Le Queu, et les sculptures par A Armand de Paris. Le coffrage a été décrit par Dufourcq comme étant doté d’une «heureuse composition, la sobre élégance et quelque détail pittoresque», en particulier ses belles statues d’anges jouant de la flûte traversière et de la viole de gambe. Félix Raugel (en 1932) décrivit le son de l’orgue comme «rond, moelleux et pur». Il constata que les pleins jeux, si souvent médiocres, étaient ici traités de façon supérieure, et que l’harmonisation, bien soutenue et pleine, ne paraissait cependant pas stridente. Celle-ci a remarquablement bien survécu aux inévitables mises à jour et «restaurations». Après seulement quelques révisions mineures au XVIIIe siècle, la restauration de Ducroquet, en 1846, garda le mécanisme et la spécification en grande partie intacts, mais mit en place une nouvelle soufflerie pour augmenter et améliorer la circulation d’air. L’orgue fut réaccordé en 1880 à la hauteur de son moderne. Des altérations un peu plus importantes furent apportées en 1886, lorsque Brière, reflétant la méfiance générale à l’égard de tout ce qui était de fabrication ancienne, retira les deux demi-claviers, le récit et l’écho, et les remplaça par un récit expressif moderne. D’autres changements furent apportés pour convenir aux goûts romantiques de l’époque, et, en 1915, un amateur ajouta encore d’autres «améliorations». En 1930, on chargea le restaurateur d’orgues Victor Gonzalez de faire un rapport sur l’orgue. Il trouva qu’une bonne partie de l’instrument était demeurée dans le même état que deux siècles auparavant. Il proposa trois étapes d’améliorations, mises au point (selon l’esprit de l’époque) pour conserver le plus possible les caractéristiques et les sonorités originales. Seule la première étape fut entreprise (en 1936–1938). En composant pour le bicentenaire de l’orgue en 1939, Dufourcq le trouva en grande partie intact, et les harmonisations de Parizot changèrent à peine malgré les altérations successives. Cela est principalement dû à la haute concentration en étain (à peu près 75%) de l’alliage utilisé pour l’ensemble des tuyaux. En 1992, le fabricant d’orgues de Caën Jean-François Dupont a entrepris une reconstruction historique complète de l’orgue. Comme environ 70% des tuyaux originaux de 1739 ont été conservés et que l’on avait l’orgue de Falaise comme point de référence supplémentaire, il a été possible de redonner à cet instrument important sa gloire ancienne, en ajoutant uniquement la pédale soubasse au projet original de Parizot. Le son de l’orgue est particulièrement rehaussé par l’acoustique pure de l’église. Das, was wir über Daquins Leben und seinen Charakter wissen, hängt sehr von seinem Sohn ab, der Briefe über führende Persönlichkeiten seiner Zeit sammelte und veröffentlichte. Wenn man seinen Biographen Glauben schenken kann, war Daquin ein Mann einfachen Geschmacks, untadeliger Integrität, großer Frömmigkeit und eines unabhängigen Geistes, der über jedem Ehrgeiz und geschäftlichem Interesse stand, Ruhm erlangte, ohne danach zu streben, und die Kunst um ihrer selbst willen liebte. Selbst zu seinem größten Rivalen, Calvière, hatte er ein gutes Verhältnis. Wie wörtlich man solche Hagiographie nehmen sollte, sei dem eigenen Urteil überlassen, er war jedoch zweifellos auf dem Manual sehr geschickt. Er wurde als der beste Improvisator seiner Zeit anerkannt—und gewann sogar den Beifall von Rameau. Seine Gütezeichen waren die Präzision seines Vortrags und seine Fähigkeit, beide Hände gleichberechtigt zu behandeln. Er spielte bis zu seinem Lebensende weiter: Gemäß Sébastien Merlier in seinem Tableau de Paris versetzte Daquin nur drei Wochen vor seinem Tod eine große Menge mit einer Improvisation über Iudex crederis in Begeisterung, und sein Vortrag „flößte ihren Herzen solch lebhafte Eindrücke ein, daß alle erbleichten“. Sammlungen von Weihnachtsversen, einige davon mit Musik, begannen im 15. Jahrhundert in Frankreich zu erscheinen und fanden im 16. Jahrhundert weite Verbreitung. Noëls—Weihnachtsverse in regionalen Dialekten—hatten seit dem Mittelalter in der Weihnachtsmesse eine Rolle gespielt. Im Laufe des 17. Jahrhunderts begannen Organisten, sie als Grundlage erweiterter Improvisationen zu gebrauchen und damit die freie Zeit vor Mitternacht auszufüllen. Instrumentale und Vokalbearbeitungen von Weihnachtsliedern wurden ebenfalls verwendet. Die erste noch erhaltene Sammlung von Variationen für Orgel stammt von Nicolas-Antoine Lebègue (1676), der tatsächlich der Begründer dieses Genres war; andere von Nicolas Gigault (1682), André Raison (1714) und Pierre Dandrieu (1720) folgten. Nach Daquin gab es weitere Reihen von Michel Corrette (1753) und Claude Balbastre (1783). In seinem unentbehrlichen Buch La Musique d’orgue français de Jehan Titelouze à Jehan Alain (Paris, 1949) bemerkt Norbert Dufourcq: „Das Noël mit Variationen erforderte ein besonderes Geschick auf dem Manual. Nicht gerade jeder konnte es sich aneignen. Es ging nicht darum, Originalität zu beweisen. Es ging nur um den Geist—und die Fingerarbeit. Viele Franzosen jener Zeit besaßen beides. Das ist der Grund, warum sie frühe Meister in dieser gewandten Kunst waren, die vom echten französischen Orgelstil weit entfernt war und an beschreibende Musik grenzte … die Noëls eines Pierre Dandrieu, eines Michel Corrette, oder eines Dornel und eines Daquin, sind Impressionen in frischen Farben, Bilder mit klaren Umrissen und haben unseres Wissens keine Entsprechung im gesamten Korpus der Orgelmusik.“ Wie Jean-Jacques Rousseau in seinem Dictionary von 1768 erklärte, „sollten [Noëls] einen rustikalen und pastoralen Charakter haben, der der Schlichtheit der Worte und der Schäfer entspricht, die sie gesungen haben sollen, als sie Christus in der Krippe huldigten“. Daquin, schließt Dufourcq, war „der König der Noëlisten“. Auf dem Titelblatt werden Daquins Noëls als für „Orgel und Cembalo, von denen die meisten auf Violinen, Flöten, Oboen usw. gespielt weren könnten“ beschrieben. Es besteht kein Zweifel, daß sie im Hinblick auf den Wohlklang der französischen klassischen Orgel geschrieben wurden, viele konnten jedoch auf einem oder zwei Cembalos gespielt werden, und die einfacheren auf Kombinationen anderer Instrumente. Fast alle Melodien sind bereits aus anderen Quellen bekannt, allerdings oft mit unterschiedlichen Texten. In seiner Ausgabe von 1983 hat Christopher Hogwood alle außer einer unverbindlich mit einem Titel versehen, bemerkt jedoch, daß wir zu wenig wissen, um irgendeine andere als die weiteste programmatische Bedeutung in die Vertonungen hineinlesen zu können. Die Stimmung variiert von der Kühnheit und Brillanz der Nr. I zur Zartheit der Nr. VII (mit ihrer munteren Melodie über einem chromatischen Baß) und zum abschließenden, überwältigenden Gewicht der Nr. XII, mit ihrem Einsatz der großen pédale de trompette. Die Orgel in der Kirche von St. Rémy in Dieppe ist eines der besten noch erhaltenen Beispiele des französischen klassischen Modells und die schönste Orgel aus dem 18. Jahrhundert in der Haute Normandie. Sie wurde von dem Orgelbauer Claude Parizot, der seinen Sitz in Rouen hatte, zwischen 1736 und 1739 gebaut, wodurch sie fast zur gleichen Zeit wie Daquins Noëls entstand. Parizot war einer von drei orgelbauenden Brüdern, die in der Normandie arbeiteten. Er war auch verantwortlich für die Orgel in Notre Dame de Guibray in Falaise. In Dieppe war Georges Daniel Faul sein Assistent. Die Schreinerarbeiten wurden von dem Handwerksmeister Nicolas Le Queu geleitet und die Skulpturen von A. Armand aus Paris angefertigt. Das Gehäuse besaß laut Dufourcq eine „geglückte Konstruktion, nüchterne Eleganz und einiges malerische Detail“, insbesondere seine schönen Engelsstatuen, die eine Querflöte und eine Viola da gamba spielen. Félix Raugel sagte 1932 über diese Orgel, daß sie einen gerundeten, weichen und reinen Klang habe. Er bemerkte, daß den plein jeux, die so oft mittelmäßig waren, hier eine ausgezeichnete Behandlung widerfuhr, und daß die Intonierung zwar wohlunterstützt und voll, aber nicht schrill klang. Sie hat die unvermeidlichen Aktualisierungen und „Restaurierungen“ bemerkenswert gut überstanden. Nach nur kleineren Überarbeitungen im 18. Jahrhundert hat die Restaurierung durch Ducroquet im Jahre 1846 den Mechanismus und die Disposition weitgehend unberührt gelassen; es wurden allerdings ein neuer Blasebalg installiert, um den Luftstrom zu erhöhen und zu verbessern. 1880 wurde die Stimmung auf eine moderne Tonhöhe angehoben. Einigermaßen tiefgreifendere Veränderungen wurden 1886 vorgenommen, als Brière im Zuge des allgemeinen Mißtrauens gegenüber alter Herstellung die zwei demi-claviers, das récit und das d’écho entfernte, um sie durch ein modernes récit expressif zu ersetzen. Andere Änderungen wurden vorgenommen, um sich dem Geschmack der Romantik anzupassen, und im Jahre 1915 wurden noch weitere „Verbesserungen“ von einem Amateur ausgeführt. 1930 wurde der Orgelrestaurator Victor Gonzalez damit beauftragt, einen Bericht über die Orgel vorzulegen. Er fand sie weitgehend in dem Zustand vor, in dem sie zwei Jahrhunderte lang gewesen war. Er schlug drei Stufen von Verbesserungen vor, die zum Ziel hatten (wie man es damals sah), die ursprünglichen Dispositionen und Wohlklänge so weit wie möglich beizubehalten. Nur die erste Stufe wurde ausgeführt (1936–1938). Als er im Jahre 1939 für die Zweihundertjahrfeier der Orgel etwas schrieb, fand Dufourcq sie weitgehend intakt und Parizots Intonierungen kaum verändert, trotz der nachfolgenden Eingriffe. Einer der Hauptgründe hierfür ist der hohe Zinngehalt der Legierung (etwa 75%), die für das Pfeifenwerk verwendet wurde. Im Jahre 1992 nahm der Orgelbauer Jean-François Dupont aus Caën eine vollständige historische Rekonstruktion der Orgel vor. Da etwa 70% Prozent des ursprünglichen Pfeifenwerks von 1739 erhalten ist, und mit der Orgel in Falaise als zusätzlichem Anhaltspunkt, war es möglich, diesem wichtigen Instrument seine frühere Pracht wiederzugeben, und nur das Pedal soubasse Parizots ursprünglichem Schema hinzuzufügen. Der Orgelklang wird durch die gute Akustik in der Kirche noch bedeutend verbessert.